Year 5 students Romeo, Georgia and Max interact with a Gomer robot in their DigiTech class. Armed with face and pattern recognition, movement and ‘soft hand’ grabbing capabilities, the Gomer provides students with the opportunity to extend their expertise in programming, robotics and artificial intelligence. 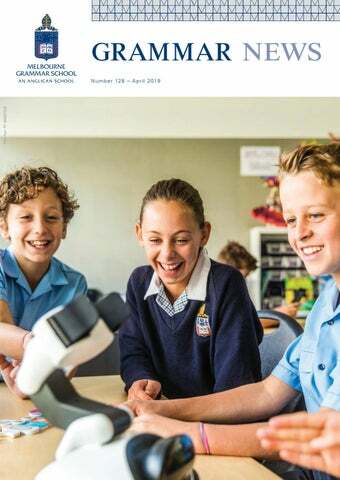 Find out more about Design & Technology at Melbourne Grammar School on pages 16 – 17. Year 12 student Jasper Harrington’s performance as Shakespeare’s eponymous villain in the 2019 Quad Play Richard III was a masterly display of acting skills, thrilling the audience with a gripping realisation of a character undone by his own Machiavellian ambition. From the School Council Redeveloping a School treasure Sidney Myer’s acts of public philanthropy are legendary. One of my favourite stories relates to Christmas Day, 1930, during the Depression, when Sidney endeavoured to bring some Christmas cheer into the lives of Melbourne’s struggling and unemployed. According to Rod Myer’s biography of Bails Myer, In Full Stride, Sidney hosted a Christmas Dinner at the Exhibition Building for 11,000 people! ‘The meal was a staged affair, running from 10:30am till well into the afternoon. It involved literally tonnes of food and 1000 gallons of beer. Not only did Sidney provide the meal, he hosted it, greeting diners at the door and served them with the aid of 300 Myer staff members’. A band played, every child received a present, and free tram travel was provided. Sidney’s family, now in their fifth subsequent generation, with their spouses and partners, have continued that tradition of great generosity. Next year will mark the 60th anniversary of the opening of the Myer Music School, in Domain Street, South Yarra. Before the initial construction of the Music School on land at Number 3 Bromby Street, an Application to Court was required to remove a restrictive covenant from the Title, and preliminary hearings were held in Chambers on 14 December 1959 and 15 February 1960. Meanwhile, Messers. Mockridge, Stahle and Mitchell, the School Architects, continued their preparation of working drawings and specifications for the new Music School. After due deliberation, the Executive and Finance Committee awarded the construction contract to Morisons Pty Ltd. A letter from the Chairman of the Committee was sent to Mr Ken Myer, and copied to his brother-in-law, Mr Ross Shelmerdine, thanking the members of the family for their generous gift of £23,843 to meet the cost of the construction of the Myer Music School. This donation from the Myer family was all the more remarkable because the philanthropic donations from the Sidney Myer Fund were being directed at that time toward the construction of the Sidney Myer Music Bowl. Again, according to In Full Stride, Sidney Myer ‘had a particular love for classical music and was himself a violinist’. And, the Myer Music Bowl ‘had its genesis in Sidney’s love of outdoor music performances’. Melbourne Grammar School has a long and rich musical tradition. Music received an additional impetus when Donald Britton, Cambridge Scholar and a serving officer in Wingate’s ‘Chindits’, was appointed Director of Music by Sir Brian Hone in September 1953. Sir Brian regarded ‘music as perhaps the most civilising of educational influences’. From the Headmaster Deputising at Melbourne Grammar Mr Nick Evans joined Melbourne Grammar School in 2014 as Deputy Headmaster and Head of the Senior School. He was previously teaching at Wesley College, where he was promoted through a variety of senior roles, including Head of the Senior School at Wesley’s St Kilda Road campus. I well remember Nick’s opening address to the Melbourne Grammar boys in the Old Melburnians War Memorial Hall in which he confidently stated that he was “proud to be working here at Wesley College!” The mixture of student hisses and laughter that greeted him was met with a broad smile and an apology that won over his audience and gave an immediate glimpse into the warm character that has been the hallmark of his time at MGS. It has been a pleasure to have worked with Nick for the past five years at MGS. He and his family, including wife Elly, daughter Stella and son Sam, have been an important part of the School community. What was quickly apparent was the way in which Nick identified and worked hard to ensure that the vibrant and respectful nature of this School prevailed, and he has expertly nurtured this aspect during his tenure. Nick has been very approachable to students, staff and parents, well known for being fair and even handed in his decision making. As Deputy Headmaster, he has chaired a number of important School committees including the IT Steering Committee and the Occupational Health and Safety Committee. He also chaired the Critical Incident Management Team meetings, dealing with some very difficult issues en route. Nick played a significant role in establishing the Gay Straight Alliance in the Senior School and worked hard to ensure an inclusive culture became entrenched, especially with respect to homophobia and misogyny — not the easiest of tasks in a boys-only Senior School. He played a leading role in MGS gaining accreditation as an eSmart school, effectively managing student cyber risks and cyber bullying. Nick ensured the high academic standards at MGS remained a key focus, while introducing curriculum change in Years 9 and 10. He led the reorganisation of Heads of Faculty positions and provided them with additional planning time. As Chair of the IT Steering Committee, Nick helped create a new IT Masterplan and assisted with the establishment of the Growth and Development Teaching Framework (GRaD) as a collegial model for professional and personal growth. He led the planning process, and saw through to completion, the removal of the Senior School Common Room into a larger and far more comfortable space for staff. Nick Evans is leaving MGS to become Principal of Wesley College, Melbourne. This is a wonderful move for him, especially as he is returning to his alma mater. I take this opportunity on behalf of the entire Melbourne Grammar community to thank Nick most sincerely for his excellent contribution to this School and to wish him all the very best in his new role. In turn, I am delighted to announce the appointment of Mr Ben Hanisch to the position of Deputy Headmaster and Head of Senior School, commencing Term 3, 2019. Mr Hanisch has held this position at St Peter’s College in Adelaide since July 2016. Prior to his move to Adelaide, Ben taught at Melbourne Grammar and was a member of the Senior School Executive as Director of Senior School Curriculum. He was a highly regarded Head of Hone House for over 8 years, expertly guiding hundreds of MGS students. Holding a Masters of Education from the University of Melbourne, Ben Hanisch is a highly talented educator who is renowned for the positive interactions he has with students, staff and parents. A warm and engaging character, his reputation is founded on trust, commitment, fairness and a commitment to excellence. Mr Hanisch identifies well with the ethos and values of Melbourne Grammar. He has a strong understanding of its strengths and traditions, but will also bring a valuable fresh perspective and an innovative approach to the School. We look forward to welcoming Mr Hanisch and his family to the School in due course. 2018 Results And Destinations Outstanding VCE results Melbourne Grammar School’s 2018 Year 12 students achieved exemplary VCE results. The School is very proud of their accomplishments. Five students achieved the highest possible ATAR of 99.95 in 2018. Fifty per cent of our students reached an ATAR of 90 or more, placing them in the top 10% in the State. In summing up their achievements, Headmaster Mr Roy Kelley stated: “My congratulations go to the Class of 2018. Their talent, perseverance and sheer hard work has led to some outstanding ATAR scores and I am delighted for them and their families.” “VCE results only ever tell part of the story and the Class of 2018 can also be justifiably proud of their broader contribution to the School community,” added Mr Kelley. “As the Class of 2018 step into new challenges and opportunities, they each take with them my finest wish for a happy and successful life,” says Mr Kelley. Meet our ‘99.95’ students Of the 36 Victorian students who achieved the highest possible ATAR of 99.95 in 2018, five studied at Melbourne Grammar. Here they comment on their time at the School and their future plans. All five students were awarded a Chancellor’s Scholarship at the University of Melbourne. 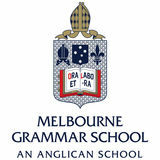 I’m really grateful to Melbourne Grammar for providing such a wonderful learning environment. I enjoyed having capable friends who were able to learn from, support and challenge each other. An ATAR of 99.95 may have always the goal but it wasn’t what I was solely striving for. At Year 12 level, it’s important to do things that might not necessarily directly contribute to achieving an ATAR of 99.95, because they all contribute a little bit to who you are. Even though they may be distinct from the academic component, they’re part of the whole process of education. When I began at the school in Year 7, older students were supportive, encouraging and caring towards me, and that was something I tried to give back when I was able to do so. I am studying Biomedicine at the University of Melbourne this year, then a medical pathway is most likely. I’m studying Science at the University of Melbourne. At this stage I’m looking at a career at the intersection between engineering and technology and, perhaps, medicine. I think that what is most important is not necessarily your score, but what has come before it. I believe that what I’ll remember most, and what I care about the most now, are all the friendships I have made at Melbourne Grammar School. The School also pushed us to really consider our world, and who we are as people. That was really valuable. I’ll be pursuing a degree in English Literature at Oxford University later this year. I also have a Choral Scholarship there. In the long term I want to look at a career in baroque music performance in opera. Throughout my years at Melbourne Grammar, I developed a lot as an individual, not only through the academic programme, but also through all the co-curricular activities I did. On receiving my result, I recognised it as a point of contentment where I was extraordinarily happy with what I had achieved. It was also a time for moving from that point to strive for great things in the future. My current plan is to complete a Bachelor of Commerce and Diploma of Languages (French) at the University of Melbourne, then use that, and subsequent engineering studies, as the basis to become an engineer. 99.95 was in my mind for the whole year, but as I was waiting for my results, its importance diminished. I realised that the final score doesn’t represent what I have achieved this year very well. Looking back, I am happy with my academic effort, but I also value the opportunity I had to start a new club at the School and work with others on worthwhile efforts. I learned a lot about myself through that experience. I’m studying Science at the University of Melbourne, while waiting on the outcome of applications to US college. Without knowing the specifics yet, my career will be in the STEM related sciences. 2018 Results And Destinations ‘Top’ students in Visual and Performing Arts Each year the finest pieces of work created by VCE students in the Visual and Performing Arts are showcased in a series of exhibitions and concerts, collectively known as the VCE Season of Excellence. This year, three Melbourne Grammar students will be involved in these prestigious events. I’m studying a Bachelor of Fine Arts at the Victorian College of the Arts this year, majoring in Sculpture and Spatial Practice. My long term goal now is to pursue art as a fulltime career. Year 12 student, Jonathan (Jono) Dunlop, will exhibit his VCE Product Design and Technology product and folio in Top Designs 2019, having completed the subject in Year 11. 2018 Will Ballantyne Scholar, Blake McCord (OM 2018), will exhibit his diverse range of artwork in Top Arts 2019. My Presence series represents an anonymous figure which doesn’t have an obligation to make sense to you – it is morally ambiguous. The initial idea came from trying to replicate a figure emerging from a pool of crude oil which was completely drenched in it. You could put as many of your own ideas onto it but, because of the oil, nothing would stick. It is everything and nothing in the same space. The philosophy behind my major piece of design was to reduce clutter and improve the functionality of a bedside table. Rather than having cords for a light, phone and laptop, with my design, all you have to do is plug in one cord. You have a light already there and, inside the drawer, you have points and usbs to charge your phone and laptop as well as a storage space for them. It means that you have a bedside table that’s neat and the notification lights on your phone and laptop don’t keep you up at night. My Year 11 Studio Art teacher, Helen Kennedy, was committed to having all students explore a wide variety of artforms. I discovered a new interest and subsequently had an unexpected realisation that I wanted to become an artist and create art every day. I like both the design and building aspects of Product Design and Technology. It’s really fascinating to see something you’ve designed on a computer become the finished product. The new Design and Technology space has everything you need to create whatever you want. You don’t really have to worry about what tools you will need when you are designing your piece. Next year I plan to study aerospace engineering. It covers areas of engineering and also involves design and a lot of mathematics, which I enjoy. It really interesting to see the power that theatre has, as an artform, to inspire change. There is such breadth you can achieve with theatre, not just to entertain – and I like doing that – but you can also make people think and make people feel about issues in our society. I think that is what is really fulfilling about it. My longer-term aim is to be a sustainable actor albeit on the screen, or in shows I have written myself, or working in smaller independent productions. I’m currently at the Victorian College of the Arts studying a Bachelor of Fine Arts (Theatre). Blake McCord in March 2019 Presence (Adam), 2018 – Rope on plaster + aerosol paint, by Blake McCord 3. Jono Dunlop’s bedside table 4. Jono Dunlop 5. Dougal Patterson performing in the 2018 Quad Play, King Lear 1. 2. 2018 Results And Destinations Post-school destinations In line with their diverse range of academic and co–curricular interests, the Class of 2018 will head into a varied set of post-school destinations. More than 63% of students received a VTAC offer for their first preference for tertiary study. This year, after all VTAC offers were made, 91% of students had received an offer for their third preference or higher. Numerous students received multiple offers, having applied to study at interstate and overseas institutions. Interstate offers to date include ANU (17), UNSW (1), Charles Sturt University (1) and Sydney University (4). Two students were subsequently offered a place at Oxbridge: Oxford (Austin Haynes, Literature) and Cambridge (John Lush, Classics). Students were also offered places at St Andrews, Kings College London, Durham and Edinburgh universities. To date, four students have been admitted to other international universities – Harvard College (Daniel Blunt), New York University Abu Dhabi campus (Bevan Chu), University of Chicago (Stanley Zhu) and Rice University (Campbell Salmon). Several other students are still awaiting the outcome of their US applications. In 2018, eight students applied to study at UK institutions. Seven students included either Oxford or Cambridge in their range of applications. Six were invited to interview and all took up this offer. ^Includes Medicine (4); Pharmacy (1)	# Law (8); Arts (27)	+ 58 at UM or Monash	* This figure is higher than the total offers, as combined degrees will cover more than one field of study. News A sense of community Taking a stand for women’s rights Perhaps Year 11 student and one of the organisers of the 2019 Walk for Women, Ben Lipchin, best summed it up when he said: “It is important that women across the world have access to their rights and can live in a place safe from violence and abuse.” This is the core idea underpinning the annual Walk. Initially conceived by Melbourne Grammar School students, the Walk for Women is in its tenth year. This time, around 630 students from government and independent schools joined forces to signal their support for the cause by collectively walking around the Tan track. Community unity This year, the Grimwade House community came together to celebrate Chinese New Year - and what a celebration it was! The festive artwork created by Grimwade students provided a wonderful backdrop for performances including diabolo acrobatics and Chinese Fan and Flower Drum dances. A spectacular Chinese Lion (dragon) even showed up for the occasion. Each participant made a donation to the United Nations Women’s organisation as part of their registration, raising more than $6,700. The funds are subsequently used to support the implementation of laws, policies, and action plans to end violence against women and girls across the world. “All of the performances were my favourite!” says Chloe, Year 1. “They were amazing, and I loved to see my mother, my little brother, my teachers and my friends altogether to celebrate the Chinese New Year together with me. It was so much fun!” “The celebration is a fun way to maximise our students’ learning of the Chinese language and culture,” explains Ms Ling Gao, Acting Head of Chinese. Supporting the homeless Now in its seventh year, the Mission to Run initiative supports young homeless people across Melbourne. On a sunny Sunday in March, more than 180 members of the Wadhurst community joined forces to raise money through the sponsorship of a group relay around the Wadhurst Oval over a four-hour time period. Organised and managed by the Wadhurst Student Leadership and Service Learning Committee (SLSC), the funds raised will be used to purchase thermal blankets and sleeping coats. They will be distributed through Youth Projects. Year 8 student and SLSC member, Stuart Galloway says: “Living on the streets is very hard, particularly as a younger person. If we can help get people warm, it might help them get back up on their feet again. About Carrillo Gantner AC Carrillo Gantner AC is Chairman of The Sidney Myer Fund. His roles have included General Manager of the Melbourne Theatre Company, Founding Director of the Playbox Theatre Company (now Malthouse Theatre), Chairman of Asialink, Chairman of the Melbourne International Comedy Festival, President of the Victorian Arts Centre Trust and President of The Melbourne Festival. He was awarded a Companion of the Order of Australia in 2019 for eminent service to the community through professional involvement in, and philanthropic support for, the performing and visual arts, and to Australia-Asia cultural exchange. Sir Jackie Stewart OBE visits the School Australia Day Honours Melbourne Grammar School community 2019 Australia Day Honour recipients include: Mr Carrillo Gantner AC (OM 1962) For eminent service to the community through professional involvement in, and philanthropic support for, the performing and visual arts, and to Australia-Asia cultural exchange. Emeritus Professor Richard Larkins AC (OM 1960) For eminent service to medicine and medical research, to education through academic leadership, to public health care, and to the community. Mr Robert Thomas AO (OM 1963) For distinguished service to the State Library of New South Wales, to business, and to the financial services sector. Mr David Inglis AM (OM 1969) For significant service to the international community through humanitarian medical programs. Mr Graeme McPherson AM (Past Parent) For significant service to print and digital media, and to the community. Mr Roger West AM (OM 1964)	For significant service to the community through social welfare initiatives, and to the law. Dr Michael Borton OAM (OM 1956) For service to medicine as a proctologist. Mr Richard Burman OAM (OM 1955) For service to the community. Mr Leonard Levy OAM (OM 1955) For service to the pharmacy profession. Mr Clive Smith OAM (OM 1953)	For service to children through charitable initiatives. Mr Terence Wills Cooke OAM (OM 1947) For service to the community. Dr James Renwick CSC (Past Parent) For outstanding devotion to duty as a legal officer in the Royal Australian Naval Reserve. Design & Technology Design & Technology: from Prep to Year 12 The study of Design & Technology is popular at Melbourne Grammar School, with students learning the principles behind both everyday and world changing objects and ideas. From the earliest days at Grimwade House, through to VCE, the understanding and application of the design process – design brief | research | design | test | produce | review – underpins the curriculum. Ideally, critical and creative thinking capacities are also built through the discipline. Grimwade House: Introducing the satisfaction of problem-solving At Grimwade House, students begin learning the foundations of the design process through Digital Technology, fondly known as DigiTech. The journey begins in Prep, with students using the coding language of visual programming as the basis of learning about algorithms, problem solving and computational thinking. They perform relatively simple tasks, like moving a robot. In later year levels, the problems become more challenging and, increasingly, have an everyday focus. “Sometimes we try and find a digital solution to a real-life problem,” explains Max, Year 5. Wadhurst: Discovering new capabilities and areas of interest At Wadhurst, the focus of Design & Technology broadens to incorporate the use of new materials and new design challenges. “At Wadhurst, Design & Technology is a celebration of the type of technological society we live in,” says Dr Phillip Hingston, Design & Technology co-ordinator. “Boys are challenged to question how things work. We try to make it interesting to them, and relevant.” “These years are about exposing students to as many new areas of knowledge as possible, so they can find out where their true interests and capabilities lie,” adds Dr Hingston. Over the two years, problem solving methodology is addressed explicitly in a progressive manner. “We have to come up with new ideas ourselves. It’s challenging, but when you can overcome problems on your own you get a sense of accomplishment,” says Year 8 student, Bill Ren (pictured left). In Year 7, students are largely experimenting with new materials, like plastics, electronic components, wood and metal, and they learn how to use the tools to shape them. “The boys are essentially asking ‘what would happen if?’,” explains Dr Hingston. “Once students have mastered the basics of design principles – termed ‘design | build | improve’ at Wadhurst, projects include building a mouse-trap car.” The theme for the classes in Year 8 is ‘communication’. Projects start with using a self-built key to send and receive Morse code, through to programming a microprocessor to perform increasingly complex tasks like setting the lighting of a pinball machine or driving a robot car. Just about everyone needs some basic computer management knowledge these days. But even those who you’d assume would be digital natives – like Year 7 students – sometimes don’t have the fundamentals in place. That’s where the Wadhurst subject ‘My Digital World’ steps in. Just one week after starting the school year, our Year 7 students found themselves far from the classroom learning how to surf, snorkel, set up tents and cook their own camp meals at Point Leo on the Mornington Peninsula. This outdoor education experience, dubbed ‘Entering the Gates’, is a new addition to Wadhurst’s Year 7 transition program. “One of the main things that makes boys feel comfortable inside and outside the classroom is the formation of new friendships,” says Tom Bowler, Student Transition Coordinator at Wadhurst. “Through an experience like this, boys have the opportunity to meet others outside their immediate circle at this important point in the school year.” And the students concur. “I thought it was a great experience to start off the year at Wadhurst,” says Will Griffin. “It helped me learn more about my classmates and my teachers.” Will Armstrong also enjoyed the experience. “It was a perfect way to get to know each other,” he says. Along with a range of beachside activities, Entering the Gates also includes time for each House group to set goals for the year. Students also participate in challenges that encourage communication, planning and problem-solving. “Boys who are already passionate about camping can help those who aren’t so confident,” Mr Bowler explains. “An environment like this puts some boys outside their comfort zone, and this is a great opportunity to build resilience and learn how to collaborate with others.” An important factor in the success of the camp is the fact that the majority of materials – including tents, wetsuits, snorkels and sleeping mats – are provided for each student. Science outside the classroom At Melbourne Grammar School much of the study of Science occurs within the classroom but, on occasion, students are given the opportunity to further their learning in the outdoors, as we did on a recent cross-country ski tour, touring the trails around Falls Creek. Every day some time was allotted to ‘science hour’, and Mr Baylis and some of our other experienced guides shared the science of the environment in which we were skiing with us. For instance, we learnt that the patterns imprinted on the bottom of our skis allowed us to grip the ice, particularly when skiing up hills. There was also a layer of wax on them, which melted the ice slightly as we skied down the hill, so that we could glide smoothly. We also learnt about the albedo effect, where ice and other materials reflect sunlight, which cools the earth sightly as there is less energy (heat) being trapped by the atmosphere. However, due to climate change, there is less ice to reflect the heat and what ends up happening is the negative feedback cycle of global warming. It is information such as this, learnt while in the field, that shapes how we view our future. Backcountry safety was a vital element of the camp. We learnt through first-hand examination that there are different layers of snow and ice. The Old Melburnians Council OM Mentoring Programme: assisting younger OMs in their career This year we expect to connect 20 – 30 younger OMs with more experienced OMs as part of the programme that will last for 12 months. We aspire to build on these numbers in years to come and refine our approach as we get more feedback. Should you wish to register your interest in being either a mentor or a mentee, or to seek out a suitable mentor, I suggest you do so via OMLink. The mentoring of younger people by those more experienced occurs in all walks of life, and has done so for ages. In ancient times, it was said Socrates mentored Plato who mentored Aristotle who, in turn, mentored Alexander the Great. Thomas Edison mentored Henry Ford before he built Ford Motor Company. Bob Dylan was guided by Woody Guthrie. Bill Gates counts Warren Buffet as his mentor. Silicon Valley greats such as Steve Jobs, Jeff Bezos, Larry Page and Eric Schmidt were all mentored by the late Bill Campbell. Bill Campbell’s key message to his mentees was: “Leadership is about recognizing that there’s a greatness in everyone and your job is to create an environment where that greatness can emerge.” Campbell’s wise advice is relevant to OMs participating in the OM Mentoring Programme which the OM Council has been developing over the past few years. The OM Mentoring Programme seeks to add to the informal mentoring that already takes place across our community and in the workplaces of OMs. The programme’s objective is to assist younger OMs in their career by connecting them with a more experienced OM in their chosen field. The mentor selected is typically someone able to offer helpful career insights and guidance, and act as a sounding board for 12 months and possibly beyond. My experience as a mentor in the 2017 pilot programme was a positive one. My mentee was keen to get some guidance as he moved from a large organisation to a similar one to my firm. Although the main focus was helping him navigate that transition, I enjoyed our discussions and benefited from his insight into how people of his age were thinking. We met for coffee or lunch every two months for 18 months. At that stage he was well settled and enjoying the new role, and I connected him to another OM in our field who I thought could also be of ongoing support. Renowned for his research into the genetic response to human disease, Professor Simon Foote (OM 1976) is one of Australia’s pre-eminent medical biologists. Although it may sound incongruous, Simon credits his French teacher, Mr Alby Twigg, with his decision to pursue a medical research career. “I loved learning French at Melbourne Grammar School, particularly under the tutelage of Mr Twigg,” explains Simon. “He ignited a desire in me to study overseas so, while completing a medical degree at the University of Melbourne, I took two years off to participate in a large medical research programme in Paris.” “That was the beginning of my research career,” says Simon. “If it hadn’t been for Mr Twigg, I would have become a full-time medical practitioner instead of a full-time researcher.” Today, Simon holds the extremely rare status of a Fellow of three Australian Academies: the Academy of Science, the Academy of Health and Medical Sciences, and the Academy of Technological Sciences and Engineering. His career has included a post-doctoral position working on one of the early maps of the human genome at MIT, over a decade working in genetics at Melbourne’s Walter and Eliza Hall Institute, Director of the Menzies Research Institute at UTAS, and Dean of the Medical School at Macquarie University. Simon is currently Director of the John Curtin School of Medical Research at ANU. Ultimately, Mr Game’s report gave the federal opposition justification to block supply and the dismissal of the Whitlam government followed. Reflecting on his role in the constitutional crisis, Mr Game says his desire to follow a good story eclipsed any political preferences he may have had. “It is a bit overwhelming to think you’ve become a part of history,” he says. By coincidence the man who would follow Whitlam, Malcolm Fraser (OM 1948), also attended Melbourne Grammar during Mr Game’s time at the School, though Mr Game cannot remember him as they were several years apart. The Melbourne Grammar School community is pleased to congratulate the following couples who recently celebrated their marriage in the Chapel of St Peter. in three years, and was also the first game using the new Angus McKay scoreboard. The 1959 team were acknowledged by Dr Marcus Richards at afternoon tea and the Xavier captain came over and congratulated these Old Melburnians. 1979 First VIII Crew Head of the River reunion Each year, at the APS Head of the River, winning crews from each past decade are celebrated. Accordingly, this year, the Melbourne Grammar First VIII crews from 1949 and 1979 were invited to a special event. Tony Smith (OM 1949) represented the 1949 crew; he was also the coach of the 1979 First VIII. Eight of the nine members of that crew were in attendance for a lunch provided by the Nagambie Shire Council and to watch the 2019 Head of the River. World Cup Gold for snowboarder Cam Bolton Australian dual Olympian Cameron Bolton (OM 2008) has claimed his first ever FIS Snowboard Cross World Cup title in Feldberg, Germany. The victory was even sweeter for the 28 year old who crashed on this course three years ago which resulted in a serious injury. Chief Justice Alstergren In December 2018, the Hon Will Alstergren (OM 1980) was sworn in as Australia’s fifth Chief Justice of the Family Court of Australia. Chief Justice Alstergren is honoured to take the appointment as Chief Justice of the Family Court of Australia. Having been the Chief Judge of the Federal Circuit Court of Australia for just over 12 months, his Honour has a clear vision on how to improve the family law system for the benefit of the families who seek to resolve their disputes. “I take very seriously the responsibility for ensuring the effective, orderly and expeditious discharge of the business of the Court and to maintain public confidence in it. The duty is not only to manage the existing work of the Court but also to develop steps to improve the way the Court goes about its work,” Chief Justice Alstergren said. History publication award Greg Eccleston (OM 1957) is a retired land surveyor, who spent much of his career carrying out government surveys in remote parts of Victoria and New South Wales. His book, Granville Stapylton, Australia Felix 1836, Second in Command to Major Mitchell, was launched by Professor Emeritus Geoffrey Blainey at the Royal Society of Victoria in May 2018. The book was announced the winner of the History Publication Award for ‘the most outstanding non-fiction publication on Victorian history’ in 2018 at the recent Victorian Community History Awards. Cricket Club success Congratulations to the Old Melburnians Cricket Club, who won their first ever premiership defeating arch rival Old Scotch by four wickets in a nail-biting affair at Scotch. The Club has turned around from a winless team four seasons ago to a premiership one. The Best and Fairest trophy has been officially named ‘The Doc’ after Dr Marcus Richards, a key supporter of the Club for more than 20 summers as Teacher in Charge of Cricket at the School. Dr John Matthews (OM 1959) greets Dr Wilson Brown (OM 1959) at the 1959 (60 year) reunion. Mr Peter Field (OM 1959) looks on. Welcome to what we hope will be another wonderful year together at Melbourne Grammar School. In 2019, Friends of Grammar (FOG) would again like to welcome all parents and families across the School, to connect within our community. A parent-run committee across all three campuses, Grimwade, Wadhurst and Senior School, FOG’s main purpose continues to be fostering friendships, supporting a range of social and fundraising events and enhancing our children’s sense of belonging within their school. Parent volunteers are a significant part of all Friends of Grammar activities and we are extremely grateful to the many dedicated parents who give their time each year. Whether it be organising social events, helping at BBQs or supporting our School’s values and social initiatives, we thank you. Similarly we are also grateful to the School and staff for their ongoing support and encouragement of our work. This year, our upcoming events include the annual whole school Grammar Lunch to be held on Friday 10th May 2019 at The Glasshouse, where we look forward to enjoying a fun and relaxed afternoon together. From the Archives Marking time at Melbourne Grammar The clock that sits at the top of Witherby Tower today may look identical to that seen in early photographs of our School, but its history is one of technological change. The clock’s technology was impressive, even at the time it was commissioned in 1876. Joseph Bros. of Swanston Street was given the contract to create a clock with four dials, each six feet in diameter. The idea for the mechanism behind the clockface had been developed in 1854 by Sir E.B. Denison for London’s Big Ben. His cutting edge (for that time) technology enabled the clock to keep regular time without the assistance of meteorological observations, as was the usual practice at that time. Internally there was a minute and seconds dial, a double three-legged gravity escapement with agate pallets, and a compensated wood and lead pendulum vibrated every one and a half seconds, according to a description in The Melburnian, 1876. Attachments drove sympathetic clocks around the School. Boarders could even choose to have one installed in their room for a fee of five pounds – a hefty sum in those days. The clock began operation at 5pm on Thursday 21 December 1876, the year the tower was completed. However, because the bells had not been installed at that time, the clock was reported as “handsome but not yet striking” in The Melburnian. The bells were installed in 1877. Clocks were a luxury item in the late 1900s, so many people living in close to the School also used the clock as their source of time. As late as 1987, the School plumber was still charged with climbing Witherby Tower every Monday morning to wind the clock. Today, winding is unnecessary with the mechanism being replaced in 2008. Now, the clock makes use of satellite and computer technology to keep precise time and changes automatically to reflect daylight saving. Witherby Tower Witherby Tower is named after Hubert Witherby, a former student of Melbourne Grammar’s second Headmaster, Mr Edward Ellis Morris, when Mr Morris taught at St. Peter’s College, Radley in England. Ill with consumption, young Witherby was attempting to return to England from New Zealand but only managed to get as far as Melbourne. Here, the family sought help from Mr Morris and Hubert Witherby was cared for at Melbourne Grammar until he died. The tower was paid for by Hubert Witherby’s father, Arthur Witherby, who was grateful for the support his son had received at Melbourne Grammar.